Care College of Pharmacy. Participants - 115 students and Faculty. Vivekananda Keshava Vidyaniketan, Kantaathmakur village. Students 90. Faculty. Children did paadarchana and offered flowers at the feet of the teachers with great Shraddha. Guru stotram, Guru Purnima message and shanthi mantra as well as Kendra Prarthana were common in all the programmes. 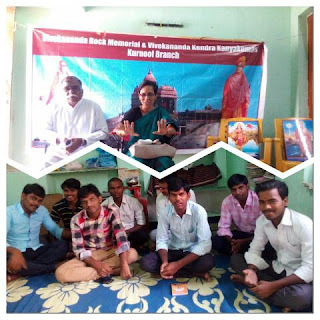 The utsavas were organised and conducted by VK Yuva karyakartas and Alpakaleen Sevavrati from Kadapa serving in Warangal, Sri Venkata Subbaiah. V​ivekananda ​K​endra​ Kurnool​ Branch​​ ​ organised at Thandrapadu village - 16 people - mainly youth participated. Smt Parvathi, Associate Professor, Hindi, spoke on Water the Roots. Shri Sivaprasada, Vyavastha Pramukh, VK Kurnool, spoke on the significance of Guru Purnima as a Kendra utsav. V​ivekananda Kendra Vijayawada​ Branch​ - 21 participants - Smt Vijayalakshmi, Nagar Pramukh, Vivekananda Kendra - Vijayawada branch, spoke on Water the Roots and Shri G.Shriram spoke on Maharshi Veda Vyasa.